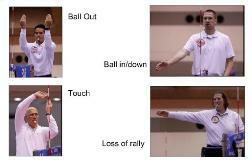 The following are procedures and techniques of the volleyball second referee. 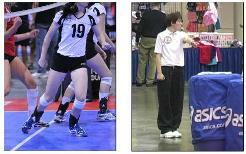 These officiating techniques are for USAV Domestic Competition Regulations 2011-2013 Indoor. One of your responsibilities as the R2 is to watch for net contact. The only net contact that is illegal is when a player contacts the top tape in action playing the ball. When you whistle a net fault, first indicate that a net fault has occurred then indicate with an open hand the player that contacted the net illegally. Legal net contact should been seen but not whistled. The whole foot has to cross the line for it to be a centerline fault. When signaling, the referee is standing on the side of the net of the player that committed the fault. The correct sequence is point to the line, point to the player, then point with an open hand toward the team that wins the point. Whistle and signal when the ball is outside your antenna. 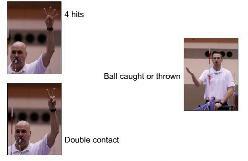 After signaling, mimic the first referee signaling ball awarded to opponent. Line judges of course can help with this call. If you aren't comfortable making overlap calls, let the first referee know before the match. Even if you are a junior referee and aren't going to be calling any positional faults, you should always be watching the receiving team during service action. After the service has occurred, move to the blockers side of the net and be ready for any net faults or centerline violations during the rally. There are two signals you don't mimic as a second referee. 1. The beckon signal for service. 2. A served ball that doesn't cross the net. As a second referee, you are responsible for whistling and signaling time outs. It's recommended that you carry a stop watch or other timing device so you can time the 30 second time outs. This is part of the duties as a second referee. When a coach or captain requests a timeout, blow your whistle. Next, show the time out signal, then indicate to the referee which team requested the timeout. Next, signal to the referee how many time outs each team has taken and start your watch to time the 30 seconds. At the end of the 30 seconds, whistle both teams back onto the court. When a team has taken it's second timeout, let the coach of the team know that he or she has used both timeouts for that set. The substitute must be in the substitution zone for a request for a substitution. According to the substitution rules, a request doesn't actually occur until the substitute is in the substitution zone. If the coach is calling for a sub, you must not whistle until the player is in the substitution zone. This can be a difficult situation because very often the coach will verbally request for a sub. As you continue to practice not whistling until the right time, you'll get better as the season progresses. When you whistle for a request, be sure to get both players numbers in your head. Next, show the correct signal for player entry. The players must see the signal. Make sure you look at the players and see that they see you make the signal. Also, look at the scorer and make sure they document all the right information on the score sheet. Make sure the score keeper is ready before you give the ready signal to the first referee. Rotate the arms once or twice to signal the substitution. Start low and sweep your arm upward to about your waist. You want to make sure the players see this signal before entering the court. Once the volleyball substitution is complete and the scorer is ready with the sub correctly recorded, move to the receiving side of the court and give the first referee the ready signal. Whistle when the first substitute enters the zone. Ask the substitute from the other team to wait while you administer the first team substitute. Once the scorekeeper has all the information down, whistle and administer the other team substitute. If more than one player from the same team are subbing, have the second player wait outside the substitution zone until the first sub is taken care of. Once the first sub has entered the court, take care of the second sub the same as the first. Make sure you aren't rushing the scorer. Once the scorer is done writing, give the ready signal to the first referee.